Many real, brick and mortar shops have a Web site on the Internet now, selling products not only at the real shop, but also on the Web site, too. This application is the solution using TM-DT especially targeted for a speciality shop with Internet sales. The Web server on the Internet provides customers information about products, location, company details and so on. It also has the Internet (Web) sales function on it. The received orders are placed in a certain folder by each shop at the Web server. At that time, the order data is written by XML data. For the POS system at a shop, the POS application is a Web-based POS application, which means the POS application runs on a Web server. 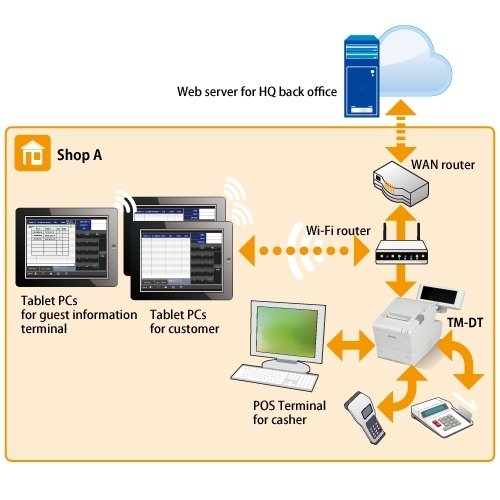 As the TM-DT has a built-in Web server, the POS application can run at a TM-DT locally without another PC server. Using the TM-DT Server Direct Print function, the order data in a certain folder of the Web server on the Internet is searched periodically, then downloaded to the TM-DT automatically when it is found. When the POS application finds the order data, the data is added to the order table, then displayed as a new order on the screen of a mobile device for in-store pickup. When all of ordered items are picked up, then ready to deliver, the operator will use the terminal to close the order and print out the customer receipt at the TM-DT or another TM printer. The mobile device(s) become POS terminal(s) at the shop, too. The TM-DT has flexible interfaces. By connecting a customer display and peripheral devices to a TM-DT, a TM-DT can be used as the casher POS terminal at the shop. The data/contents of POS system to be updated at the shop are placed in a certain folder at the Web server on the Internet. They can be searched on schedule, and automatically downloaded and replace the existing data/contents using Web Contents Update function at TM-DT. This eases support and maintenance work at a shop.